So i decided upon bullet point to makes things a little simpler. Did anyone see the part where she shook the lady’s hand and pulled her hand towards her https://www.youtube.com/watch?v=aLsnHnNO7i8 . I thought that was really weird. New ring apparently from William looks as cheap as he is. Still wearing 6 inch hill its ok when she starts to waddle she’ll learn her lesson. Kate does more weddings than she does charity work sooner or later they will be considered royal duties. She took a walk by herself oh wait she’s with her bodyguard they just cut him out because he’s not important. But I will give her a half a point for having gloves (fashion accessory); I never understood why she didn’t in the past. You do know the queen wears gloves to protect her from those horrible germs. You’re late, you’re late for a very important date. Yes she was late apparently because of the fog 2 hours late. Helicopter for a quick appearance. Same coat that I’m starting to think is fading. New dress same heels. Everyone said she had a Beyoncé moment but unfortunately that’s what happens when your belt is too tight for you and your coat is probably getting too small in the stomach area. Favorite thing about this visit is the creepy mannequin that was checking her out. My other favorite moment was the little boy picking his nose while she was talking to him. She got slammed for wearing the same coat that she wore last year. I don’t know why people were upset Kate seems to be in denial about been pregnant at least when it comes to clothes. This was the moment I started to think Kate was doing her own hair because that hair was messy. Maybe she’s trying to cut back on spending so they can finish renovating anmer hall. It seemed like she was on some kind of drug more than usual at least and I think William knew maybe she was drunk, idk. Kate is still in denial about how growing a little person in clothing wombs will alter her clothing. This dress and coat were already short but even shorter because of her belly. Not appropriate at all. Yah! The important news is that this was the first public appearance the queen has made since she was sick. She looked a little pale and looked like she lost some weight but in great spirits. Probably the most appropriate coat she’s worn in a while if only it was longer. We get it Kate your legs are skinny even when you’re pregnant. Congrats. Apparently she invited herself to the event. But honestly we will never know and I think the queen only agreed to her coming along because she knew that it would get out eventually that she either accepted or denied her joining her. Again the queen is a Taurus and they don’t like conflicts. 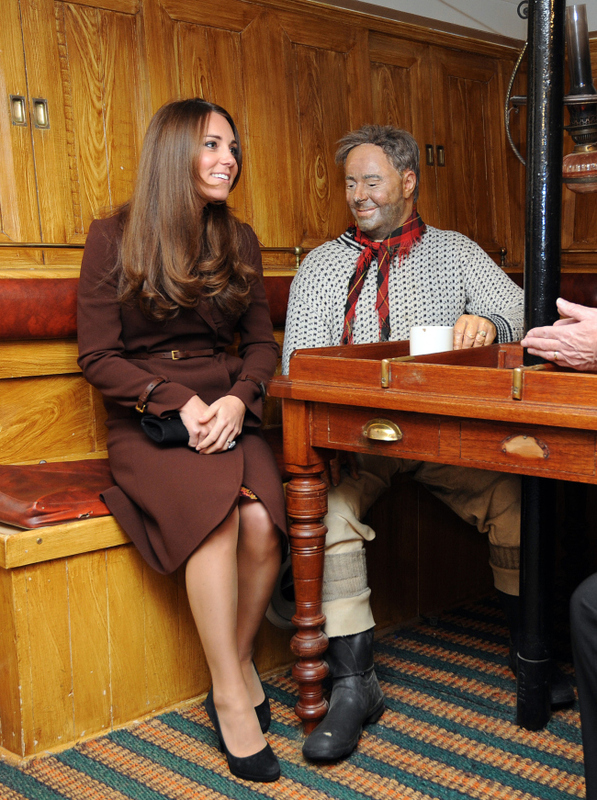 People were confused about her visit the camp, but to clear things up she is not the president Prince Edward is Kate is just a volunteer. I have a problem with the cameras there if this is just her volunteering. Any other time she’s volunteered there have not been cameras, why now Kate. I think she just wanted to finish the week out on top and in the snow. Her paint on jeans kind of not appropriate for the weather or the event. Full make and jewelry yeah not appropriate. The fake smile was out and being creepy. She get and +1 because she actually got her hands dirty when making twists. But she was not thinking when she did that because she was wearing her rings. Gross Kate your rings have germs on them all the reason not to wear them. Oh apparently she said she’s going to work ‘til she drops. Her hand has Velcro on it that’s why it’s always in the same place, and of course to show off her growing womb. Weigh in and tell me what are your thoughts are about Kate and her back-to-back events.